I was piling the manure this weekend when my tractor started cutting out momentarily. The fuel level was a really low and I was tipping the tractor quite a bit, so I filled it up and restarted. Didn't want to restart. If I crank the key it will fire occasionally but not keep running. Thinking that the low level might have let something get stirred up in the tank, I changed out the rear filter and the bowl cartridge. Now I can't get the bowl to refill with fuel. The lines from the tank to the fuel pump are flowing, and the line from the fuel pump to the bowl is flowing-I can push fuel through that line with a hand pump. When I turn the key to the first position I get little squirts of fuel out of the pump. 1. How much pressure should be coming out of the pump? 2. Do I have to vent the bowl if I got air in the line from the fuel pump? 3. Is there someplace else I need to bleed because it ran out of fuel? I think these are self-priming, but I'm not sure. I've checked the seat shut-off switch and the fuel shut-off solenoid and both are functioning. Your owners manual should go through the fuel bleed procedure. I don't have your tractor but here goes. It sounds like the fuel pump you are talking about is the low pressure lift pump. You have to bleed all the air out all the way to the high pressure injector pump on the engine. Near where the fuel line fastens to the injector pump, there would be a bleed screw. 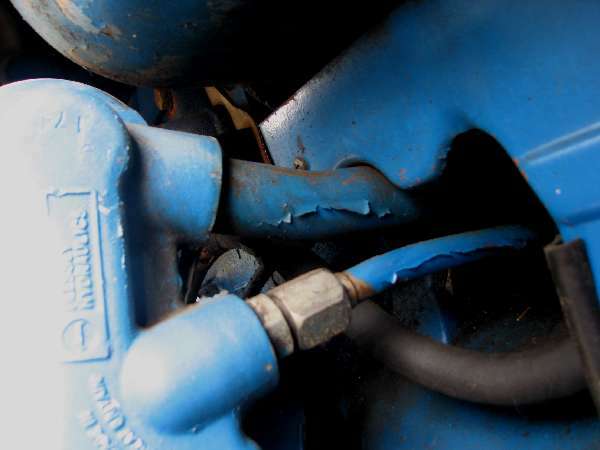 It sounds like you would have to turn your lift pump on while you are cracking open the bleed screw. You should see the filter bowl filling first then come out of the bleed screw. Hope this helps. I found the manual for the engine and they claim no bleeding needed. I pulled the hose off where it goes into the high pressure pump-no fuel flow. I guess the lift pump is blown? I can push fuel through with a hand pump from the outlet of the lift pump to the bowl. This will be the second lift pump I've put in.